Phil Jaber, the founder of Philz Coffee, wants to caffeinate the world. In February he’ll take another step toward that goal when he opens a new location in Facebook’s Menlo Park complex. “I have a thousand shops in my head and I’m going to open them one a time,” Jaber said on a recent weekday. Many of the locations that he and his son, Jacob Jaber, have opened recently were possible because a regular at their coffee shop turned into a client. Six months ago a Facebook employee telephoned Jacob Jaber and told him the company was interested in having Philz be part of a courtyard project that would feature several local businesses. Facebook had been serving Philz coffee in its cafeterias for several years, and many Facebook employees had become regulars at Philz’ two Palo Alto locations, Jacob Jaber said. The 1,500-square-foot location is expected to open Feb. 20. Since launching the first Philz Coffee in 2003 at 24th and Folsom streets, the company has opened eight locations in the Bay Area. It also sells coffee beans in 22 Whole Foods stores and distributes to Google’s cafeterias. In April 2011, Virgin America started pouring Philz coffee on board its planes. The expansion doesn’t stop there, Phil Jaber said as he sipped a cup of his Tesora blend in a small office in the back of the 24th Street shop. This year the family-run company has plans to open three other locations, including two in San Francisco — at 24th and Douglass streets and at Larkin Street and Golden Gate Avenue — and one in Sausalito. Next year the Jabers want to open in Cupertino and in Southern California — they’re not sure where yet. Besides good coffee, the secret to growing the company seems to be patience and perseverance. “I have quality coffee, why be shy?” Phil Jaber said. 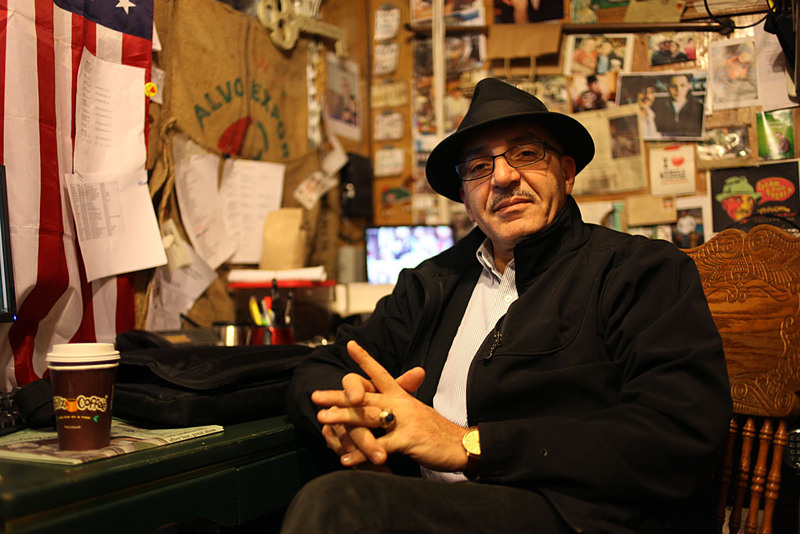 Before opening his first coffee shop, Jaber owned a liquor store at the same location. For 25 years he studied coffee and perfected his first blend, Tesora. He said that before he opened Philz he visited 1,100 coffee shops, spending as much as $6 each visit. The coffee wasn’t what Jaber was interested in during those visits. He was confident in his product. Instead he studied customers — why they were there, how they looked, if they were relaxed and comfortable. He also studied the employees and how the managers acted. Nowadays Philz has 300 employees. Each goes through three interviews and the same training before they’re allowed to pour a cup of coffee. “My first priority is clientele service,” Jaber said, explaining that Philz employees have 18 seconds to acknowledge a customer from the time he or she walks in the door. Phil Jaber is the first to work, according to his rules. He visits his coffee shops daily, saying hi to customers, and happily gets behind the counter to make someone a cup of coffee. When he’s not asked to open in a specific location, he picks a company he likes, studies it as he did coffee shops years ago, then approaches management. That’s what he did with Virgin America. Jaber flew several airlines, observed the way they interacted with customers, and liked what he saw on Virgin America flights. After several months of back and forth with management, they got on board. Next on his horizon is the cruise industry. “I conquered the sky … I’m trying to conquer the sea,” Jaber said. “Like Frank Sinatra was born to sing, I was born to make coffee,” he said, smiling. I remember going to Philz as a kid when it was still a liquor store for my fix of chips, soda & candy…and the occasional household item that my mom needed. Great to see him doing so well. Great article Helene. There is no surprise that Philz is doing well. The man is fantastic and his coffee is better. At $8 a cup, no thanks. Where are you getting that price? Almost all Philz coffee is $3-4 a cup, and it’s well worth that price. I wish Phil luck in his goal to caffeinate the world. It’s also nice to see him out there creating jobs. This place is awesome because Phil never sits back to watch. Always around, talking to his customers, making sure everything is as it should. His personal dedication shows in the coffee and his establishments. Exceptional coffee and service every time! The only problem with Philz is the inevitable, tragic disappointment you will suffer in any other part of the world when trying to get good coffee. You may not realize it, but your standards have risen to heights sustainable only with more Philz. Phil is the nicest guy in the world, and he and the Philz family deserve all their success. Wow! Good going, Phil! My girlfriend lived nearby what used to be the Philz corner store. We could leave him our keys for an out-of-town guest to pick up if we couldn’t be home. He was always a community guy. So it’s wonderful to see a community guy succeed so greatly!